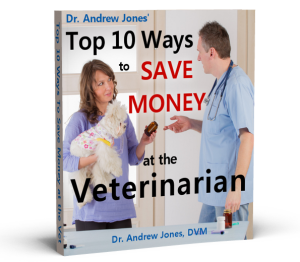 Get my free e-Book "Top 10 Ways to Save Money at the Veterinarian"
In my free e-booklet quickly find my top 10 suggestions on how you can save money at your Veterinarian today. When you sign up to receive my e-book, you’ll also be automatically subscribed to my newsletter, Veterinary Secrets. In my newsletter, I’ll keep you updated on the latest ways to help your dog or cat – including any news on current pet food or treat recalls, better foods to feed your pet, new holistic pet health therapies and more. You can unsubscribe any time. I hate SPAM as much as you do! Your information is 100% safe and will NOT be shared with anyone else. You can unsubscribe any time.